Most state parks are open 8 a.m. to sundown, 365 days a year. 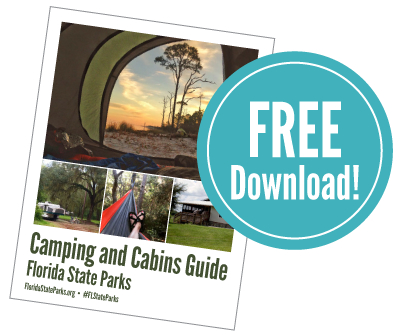 Visitors may make campsite or cabin reservations from one day to 11 months in advance by calling toll free 1-800-326-3521 or TDD (888) 433-0287 between 8 a.m. and 8 p.m. EST, or by going online to ReserveAmerica. Twenty-one parks from Pensacola to the Florida Keys provide cabins for overnight stays. Five state parks provide boat slips with water and electricity. Boaters have access to the state park's restrooms, showers, pump-outs and other amenities. Many state parks provide primitive campgrounds for those who enjoy secluded areas. Primitive campgrounds are areas designated for camping that have limited improvements such as a fire ring, cleared or partially cleared sites for tent camping, and if possible, potable water. Primitive group camping is available for organized groups. An organized group is six or more people camping together, sponsored by, affiliated with and/or members of a recognized, registered, non-profit organization. Equestrian camping is available at several state parks. Amenities vary by park and range from ride-in primitive to areas suitable for rigs. Some equestrian campsites include paddock or stable facilities and restroom with showers. Developed group camping is usually reserved for an organized group of six or more people camping together and sponsored by, affiliated with and/or members of a recognized, registered, non-profit organization. True to Ball’s word to preserve the area and to create a serene and peaceful retreat, the Wakulla Springs Lodge is an example of precise craftsmanship and offers visitors a timeless glimpse into Florida’s pristine and elegant past. To explore the history of this grand hotel is to take a voyage back in time.